Recently I went to see Mad Max in the cinema with my boyfriend. It was definitely more of his sort of film, as I like action movies but don't pick to watch them that much. 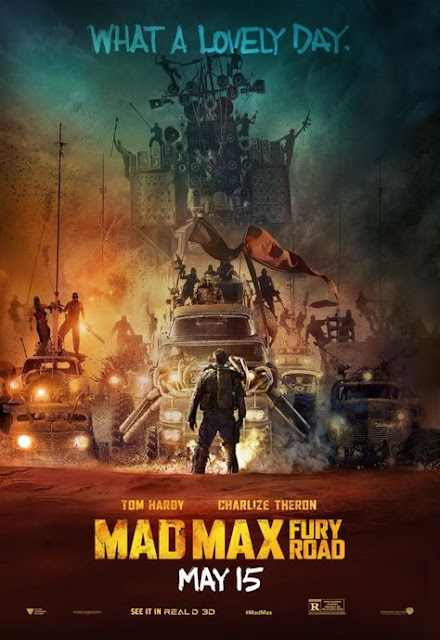 Mad Max is set in the future when humanity is very divided and focusing on the main parts of their survival, oil and water. The main characters of the movie are Max, a mad man who is kidnapped for his blood and Furiosa, a female tank driver who is convinced that she can survive if she makes it back to her homeland, the green place. This movie is way more exciting than I was expecting it to be. The whole movie is basically a two hour car chase, however it's very exciting and perfectly paced even if their isn't really a whole lot of dialogue and only when needed. The movie can be a little creepy at times, for example the guy with the big lumps on his back and the guy with the massive feet. Sometimes I was like "ew" but honestly it sets the atmosphere a lot and it feels like you are seeing it all and it is a bit mad. Tom Hardy was really good, for someone who didn't say much and being a main character, he made the character seem mad with little blinks and twitches, but it was very subtle and wasn't over the top. I absolutely loved Charlize Theron in this, she played the role perfectly and I know it's boring to say "strong female character" but she was and it was awesome to see the CGI on her mechanical arm. Mentioning CGI, I think a good reason lots of people like this film is because everything is very realistic and a lot of the stunts and if you look through this link here, it seems only really the scenery was edited and I think that is brilliant in an action film these days that they have gone to the effort of keeping everything real instead of just going oh we'll edit that in. Have you seen Mad Max? What did you think?